The customer complained about poor dissolved oxygen readings. 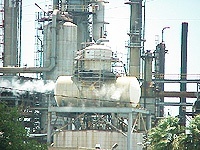 This Deaerator (DA) went into service in 1987. It has only been inspected one time since its commissioning. Upon opening the DA, the customer found corrosion on the tray enclosure door. After removing what was left of the tray enclosure door, Kansas City Deaerator found the trays upset, explaining the high dissolved oxygen readings. Tray upset is usually caused from a sudden change in pressure causing the water from the storage tank to flash into the heater where few tray hold-downs can prevent the upset. Upon closer inspection, most of the trays had corrosion along with the rest of the stainless steel internals. 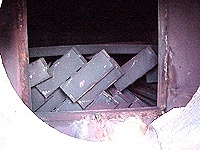 Parts of the trays and enclosure were sent off to a metallurgist and it was determined that the corrosion was from an attack of sulfide and oxygen. 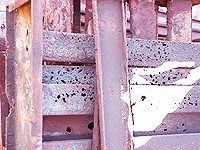 The carbon steel was not nearly as affected as the stainless steel. Kansas City Deaerator recommended replacing all of the spray valves and trays. This alone would reduce the dissolved oxygen levels and stop one part of the sulfide and oxygen attack. The customer now has low dissolved oxygen readings and has reduced the amount of sulfides they put into their system. To prevent future problems, the customer has incorporated a yearly maintenance schedule to catch upsets and problems before they get out of hand.